This has been a remarkable year–the message about what constitutes a healthful diet has finally made it into mainstream media! I tip my hat and raise a toast to all of you who made it happen: to the researchers, teachers, nutritionists, and doctors who risked careers and incomes to tell the truth; to the bloggers, authors, film makers,and all of you who saved lives by simply sharing your own success stories. The war on fat is almost over. Keep up the good work! Wishing you all a happy, prosperous, and healthful 2015! 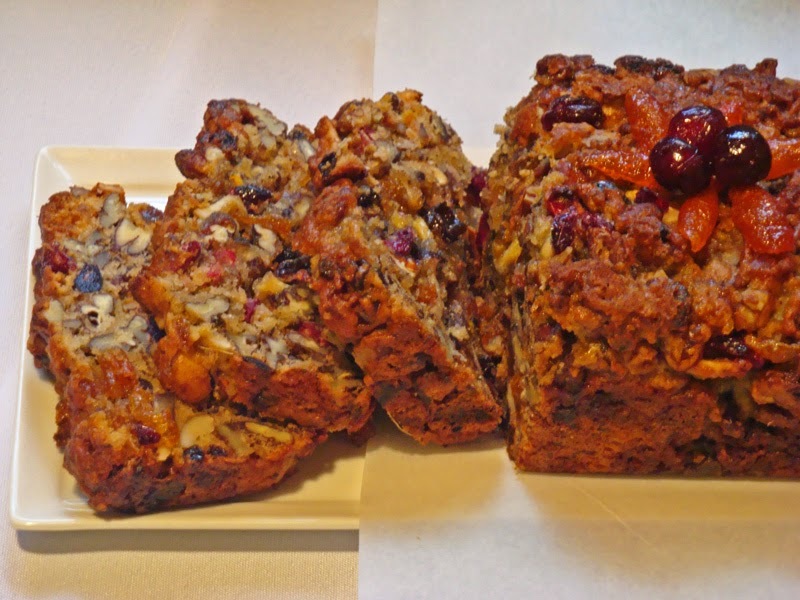 Several readers requested that I post my fruitcake recipe even though I didn’t get it up in time for Christmas. (It is still “the holidays” until after New Years Day, right? So here you go.) This is the fruitcake from Carb Wars; Sugar is the New Fat, slightly updated. I added a gluten-free version and options for some new products that are now available. Did you see the 83-year-old man on Leno who claimed to have a fruitcake baked by his great grandmother in 1878? Every Christmas brings a new crop of fruitcake jokes—obviously, a lot of people have never tasted a good one! Too often what passes for fruitcake is a dry, brown brick with a few nuts and raisins. My version is halfway between fruitcake and fruit bread. It is mostly fruit and nuts with just enough batter to hold it together. 1 cup, total, sugar-free dried fruit: cranberries, rhubarb, (Carb Wars has recipe for dried rhubarb), currents, cherries, prunes, apricots, and/or peaches, etc. Butter an 8½- by 4½-inch loaf pan and a piece of foil to cover the top. Line the pan with another piece of foil across the bottom and up the two long sides, leaving a little hanging over the sides to help with removing the cake from the pan. Butter the foil lining also. If your dried fruit is moist and chewy, you can use it as it is; if it is dry and hard, you will need to soak it in a little hot water or microwave it, covered with water, until it is plump. Taste and add a little sugar substitute to the water for fruit that is very tart, such as cranberries. Drain well on paper towels. Combine the fruit and nuts in a bowl with the ¼ cup of whey powder. Toss to coat, separating the pieces by hand if necessary. In a clean bowl, using clean beaters, beat the egg whites until foamy; add the cream of tartar (if using), and beat to the stiff-peak stage. Fold one-fourth of the egg whites into the batter to lighten, and then gently fold in the rest of the whites. Pour the batter over the fruit and nut mixture and stir until evenly coated. Spoon the batter into the prepared pan. Cover the pan with the piece of buttered foil and bake for 20 minutes. Remove the foil and bake for an additional 20 minutes, or until the cake is firm in the middle and brown on the edges. Place the pan on a rack to cool. Remove the cake from the pan, peel off the foil, and cut into 16 slices. Store cake in the refrigerator, wrapped in foil. To freeze, separate the slices with sheets of waxed paper before wrapping. You may need extra liquid if you use the gluten-free flour and xanthan gum option. Add a little more cream or water gradually until mixture is the proper consistency for cake batter before folding in the egg whites or adding the dry ingredients. *I used the Bob’s Red Mill Gluten-free Four that lists garbanzo flour as the first ingredient. Ii is lower in carbs that most others. Any low-carb bake mix should work as well. This is part of the Prosciutto Rosebuds recipe. Fruit to be candied, such as citrus peel, kumquats, cranberries, watermelon rind, starfruit slices, etc. Lightly grease a piece of waxed paper or parchment to drain fruit. Prepare the fruit to be candied. Puncture any whole fruit so syrup can penetrate. Stir the polydextrose, erythritol blend, and salt together thoroughly (to prevent lumping) in a skillet or saucepan just big enough to hold the fruit in a single layer. Stir in the water. If pan is too big, you may need more syrup. Set pan over medium-low heat and bring to a simmer. Cook until liquid thickens to form a syrup. Add fruit and simmer, stirring occasionally, until the syrup is thick and the kumquats darken and become translucent. It may take about 30 minutes, but time may vary, so go by how the kumquats look–they should look candied. Add more water if necessary. Turn off heat. Dip fruit out with a slotted spoon or sieve and let excess syrup drain back into pan. Spread in a single layer on waxed paper or parchment and let stand to cool and dry out. Sprinkle with granular sweetener if desired. Candied Fruit, Christmas Dessert, Fruit Cake. Bookmark. My pleasure, Kathy! Hope you enjoy it. You could try using fresh ones, but they wouldn’t be chewy like sweetened dried ones. If you simmer them with a little sweetener that has bulk, like Swerve or erythritiol, and then drain them and aqueeze out the liquid, they would work better. Edna, or you could just use more of one of the other candied or dried ingredients to get the total amount.